Presented by three chronic pain experts from the Rehabilitation Institute of Washington (RIW): Dr. Kathleen Burgess, physiatrist; Randy Hermans, physical therapist; and Dr. James Moore, psychologist and RIW director (http://www.rehabwashington.com/). Presented on June 8, 2010 at the University of Washington Medical Center. Read the report or watch the video from this page. What is pain, and why do we have it? This definition recognizes that pain is more than an experience of the senses — what my nervous system is telling me— but also includes an emotional component. And while we know pain can be caused by actual tissue damage, sometimes people feel pain even though no actual tissue damage has happened or is no longer ongoing. The reason we feel pain is for protection. The brain interprets the pain signal and directs your body to rest or do other things in order to protect the body and/or promote healing. When the danger is over, the brain has mechanisms to actually turn pain off. Acute pain is caused by an identifiable source or connected to a specific injury, and it goes away as the injury heals or the problem resolves. Acute pain is usually easy to treat with rest, medications or other treatments. Chronic pain is any pain that lasts beyond the normal healing or recovery time. We usually consider pain to be chronic if it goes on for more than three months. Chronic pain is hard to treat—you may go to 10 different doctors and get 10 different answers. Chronic pain is poorly understood by physicians who don't deal with it a lot and very confusing and frustrating to patients and providers. We don’t understand completely why pain goes from acute to chronic, but it is a very complex process. It seems to be due to chemical and other changes in the nervous system that cause pain signals to remain active even after the original source has disappeared. The pain signaling system gets going and “forgets” to turn itself off. This is called “wind up” and is a cardinal feature of chronic pain. We know that chronic pain affects many different areas in your brain and we can see changes in the brain using special kinds of MRIs. Additionally, we know that when the pain signal goes up to your brain it also reaches the areas where memory and emotion are stored. Pain often affects the way we move. For example, a person may start to limp in an attempt to decrease or avoid pain. But abnormal movement patterns can begin to cause new pain problems. Fear of pain may also cause someone to avoid movement. Not using a limb that's painful can become habitual, and eventually this will cause further problems. 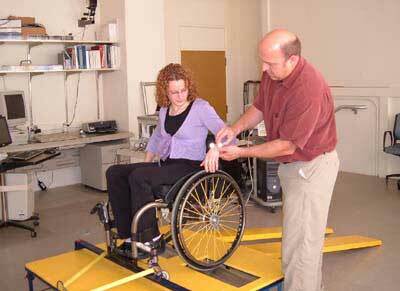 Up to 70% of people with SCI have pain. Of these, 30%–40% have pain due to the injury to their spinal cord, and 50%–60% have pain due to muscle or tendon problems. A small minority have disabling pain. A person can have many different kinds of pain after spinal cord injury, and clinicians and researchers have tried to classify the different types of pain in order to understand and treat it better. Musculoskeletal pain relating to damage to muscles, tendons and bones, such as spinal fractures, shoulder injuries, muscle spasms, arthritis, overuse, poorly fitting wheelchair and contractures. Visceral pain, caused by problems in the urinary or digestive systems (e.g., constipation, kidney stones, stomach ulcers). Neuropathic pain is caused by injury to or dysfunction of the nervous system (nerves, spinal cord and brain). This kind of pain can occur months or years after injury and is often classified by its location either at or below the level of injury. It can be caused by the original injury, by a syrinx (a cyst that forms in the spinal cord), or even by conditions not specific to spinal cord injury, such as diabetic nerve pain, nerve compression (such as carpal tunnel syndrome) or poststroke pain. Many different medications are used for the treatment of pain after spinal cord injury, depending on the type of pain being treated. When pain is chronic, you may need to try many different medications. Antiseizure medications such as gabapentin (Neurontin) and pregabalin (Lyrica). This can be very effective for numbness and tingling. It can also help with sleep, which is especially beneficial since any sort of sleep problem or disruption can contribute to pain. Other medications include muscle relaxants, like cyclobenzaprine and methocarbamol. Spasticity medications, such as baclofen and tizanidine, can be used for pain and also helps with sleep. Antidepressants, such Cymbalta and amitriptyline. Opioid medications such as morphine, oxycodone, hydrocodone, Vicodin, Percocet and Lortab. Although they are used for all kinds of pain, they are not as frequently prescribed for people with spinal cord injuries because of side effects such as decreased respiration, constipation and low blood pressure. These work best after a brand new injury. If pain becomes chronic, opioids tend to lose their effectiveness. Medications such as lidocaine, ketamine, baclofen, clonidine, and morphine may be injected into the spinal cord to treat pain. Deep brain simulation, transcortical stimulation and spinal cord stimulators are pain treatments that may be tried if other approaches are unsuccessful. Once pain becomes chronic, it can be difficult to treat with medications. People often have to try several different approaches to figure out what might work for them, including multiple medications and alternative treatments. Be confident that you are the expert regarding your condition. Remember to follow the basic rules of general health—eating right, getting enough exercise, getting enough sleep, trying to manage the stress in your life— so that these do not contribute your pain. Chronic pain is a very hot topic of research today. With advanced brain scanning techniques now available, researchers are learning more about all the different parts of the brain that contribute to pain. By Randy Hermans, physical therapist. 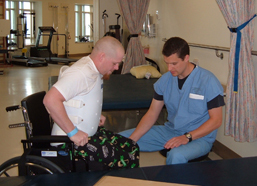 When you're first injured, you generally work with both physical therapists and occupational therapists who teach you how to move safely and care for yourself. Once you've attained those goals, you may have less interaction with PTs and OTs. But if you're dealing with a chronic pain problem, it might be time to reconnect or establish a relationship with a therapist who can help you set up an exercise program that is appropriate for you. Many different types of exercise can help with chronic pain. A good stretching program, practiced daily, will help reduce pain, decrease muscle tension and spasticity, decrease stress and improve sleep. As your flexibility improves, you will be able to do more and not have to avoid movement that was causing you pain. Being able to do more improves your mood, which further helps you manage your pain better. Relaxation also helps reduce pain. You can learn to be more relaxed by taking yoga or tai chi or learning deep breathing techniques. Every joint in the body, whether it be a finger, wrist or neck, has a position where there's the least amount of stress on it and where the muscles that control that joint are the most effective. Stabilization and good posture and body mechanics help us use our bodies in the correct, strongest and most pain-free manner. Since many things in life take us out of those optimal positions, we need to do exercises and activities that help us reestablish and maintain those positions as we go through our day. 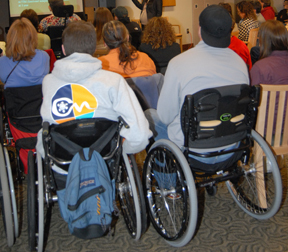 In wheelchair users, we want to be especially careful about positioning and using the shoulders, trunk and head in the proper way. A therapist can work with you on postures and exercises that strengthen and balance the shoulder blades, rotator cuff, elbow and wrist. Releases natural endorphins in the brain that can help with mood, sleep and pain management. A skilled therapist can help you set up a program of aerobic exercises that works with your health, abilities and lifestyle. By Dr. James Moore, psychologist and director of the Research Institute of Washington. Most of the people I see in my practice had serious injuries at one time and have had pain for a long time. The truth is, very few of these people completely overcome their chronic pain problems. My job in working with individuals who have chronic pain is to help them make the best of a bad situation. This means helping them learn to manage the pain so that they don't become depressed, don’t stop moving entirely, and don’t become so grouchy and irritable that it interferes with relationships. The goal is to learn to cope with it in a way that allows them to have a good quality of life. While acute pain is mostly a response to tissue damage, chronic pain is much more influenced by several psychological factors, including emotions, thoughts, beliefs and attitudes. Pain begins with an injury or tissue damage. You don't necessarily always have pain in direct proportion to the tissue damage. You might have an injury and be so distracted that you don't notice it at the time. For example, people in horrific accidents might be so overwhelmed by the danger or concern about the people with them that they don't realize they fractured a bone until an hour later when the emergency has passed. People who have pessimistic, negative or hopeless outlooks are much more likely to become depressed. People who feel others don’t care may become angry. Negative emotions—anger, fear, depression—all make the pain experienced even worse. When you have pain, you typically have a complex set of ideas and beliefs about your pain. These can come from concerns over whether your pain may signal a serious undiagnosed medical condition, is going to greatly impact your life, is treatable, is something that other people believe you have or care about, and whether you think your doctors are really trying their best to treat you. These thoughts can influence how you respond emotionally and how much pain you feel. Behavioral response to pain, or “pain behavior,” is something you do to avoid hurting more. After an injury, you might start to move in a guarded fashion or avoid activities that aggravate your pain. But those behaviors can become habitual and continue after you have healed. Some of those habitual behaviors can cause secondary pain problems. How you respond behaviorally to pain has a big influence on other people. If you're irritable or become quiet and withdrawn, people around you are affected. It's very easy to make other people miserable when you're miserable, and relationships that are important to you can suffer. Part of my job as a psychologist is to help people with chronic pain remain sensitive to other people. Control the pain as much as possible. Use distraction, ideally by engaging in pleasurable activities. One distraction technique could be to count backwards from a million by sevens. But that’s not a very enjoyable thing to do. It’s better to distract yourself from the pain by having as busy and active a life as possible, to have things that you do on a daily basis that keep you focused, interested and stimulated so you have less time to focus on pain. When people are hurting, there's a tendency to want to just stay home and do nothing. The problem is, that leaves a lot more time to focus on pain, and pain can become worse. Control fear and other negative emotions. If you fear that you're going to aggravate your pain, your focus of attention will be on the area that hurts. Your brain will actually process pain signals much more readily when there's fear associated with that pain problem. Depression and anger are also associated with increased pain. Relaxation techniques are very helpful. You can certainly reduce the pain caused by muscle tension by using relaxation. Relaxation can also distract you from your pain. Modify beliefs and expectations. Using techniques such as self-hypnosis, you can try to give yourself more positive expectations about your ability to manage pain or to lead an active lifestyle in spite of pain. The University of Washington system has a richness of really good rehabilitation psychologists who have expertise in hypnosis. People with pain have higher rates of depression. Whether and how much you get depressed is influenced by how much the pain influences the quality of your life. Most of the patients in our pain management program are not working and have suffered severe financial losses. Depression is an understandable response to this, but it is not inevitable. There are a variety of ways to manage depression. activating event (pain) that generates automatic thoughts (how you think about the pain), and this affects how you feel and how you behave. If you automatically think pain is a sign that something dangerous is going on in your body, then you might stop moving. That behavioral change can lead to worse conditioning and a loss of function, resulting in less enjoyment of life. Managing emotions requires you to become more aware of how you're thinking about what's going on in your life and to substitute those automatic negative thoughts (“I feel pain, so something must be wrong!”) with more rational or optimistic thoughts (“I know there is nothing wrong, so I don’t need to worry about it.”) that don’t lead to negative thoughts and consequences. A psychologist can help you learn techniques for changing the way you think about your pain. When you are depressed, there's a tendency to view everything in a negative way. Going out or getting together with friends seems like too much trouble, and you don't think you’re going to enjoy yourself anyway. When you view everything negatively, you stop doing things. People who are depressed often have to force themselves to get out and do things. You can combat depression by maintaining an active lifestyle that includes exercise, involvement in social activities, and doing something that feels productive. Even small things like washing the dishes can help because after you do it, it feels good to have a clean kitchen. Most people are depressed not because of a biochemical abnormality in the brain, but because their life isn't what they wanted it to be. They're not doing the things that they want to do, their marriage isn't quite as positive as they would like it to be, their relationships aren't as good, and they're not doing anything fun and interesting. To change this, you have to do some problem solving so that the quality of your life is closer to what you would like it to be. That's probably the best solution for depression. By getting out and socializing more, calling up a friend, trying to do something to make your relationship with your partner more positive—little by little, you can create a better life for yourself, and depression will automatically diminish. Antidepressant medication. Many people who are depressed are given a prescription for an antidepressant medication when they go to the doctor. This has become the usual treatment, but it is not always the best or most useful approach. The research coming out now tells us that antidepressant medications are probably far less effective than we used to think, especially for mild and moderate cases of depression. For this reason, it's important not to rely only on an antidepressant if you're feeling depressed. You should also make the behavioral changes and the cognitive changes that will help you get rid of that depression. Psychotherapy. Not all psychotherapy or counseling is the same! There are many different kinds, and not all of them are helpful for treating depression. Cognitive behavioral therapy (CBT) is considered the most effective psychological treatment for depression. CBT is a process of systematically changing your thoughts, looking at things in a different way, and changing your behaviors. Interpersonal therapy, which focuses on improving problems in your relationships and other areas of life, is also effective for depression. Supportive counseling, the most common type, may not be very effective for depression. If you're talking to a counselor and they are listening in a supportive way and being encouraging, that may not be enough to actually overcome a significant depression. Normal anxiety and fear are caused by a realistic expectation that something bad is going to happen. Pathological or abnormal fear and anxiety are caused by over-predicting the probability that something bad will happen. Avoiding activity due to fear of increased pain or further injury—called “fear avoidance”—is a common negative consequence of chronic pain. Although it is an understandable reaction to pain, the problem is that the more inactive you are, the more deconditioned and isolated you become, leading to a downward spiral of worsening depression and pain. Most people can become much more active than they realize. We hold ourselves back because we’re afraid it will hurt us. Cognitive structuring can help us overcome inaccurate pain beliefs. In this process, you identify the thoughts and beliefs you have about what moving will do to you and try to look at it more objectively. The best way to overcome fear is exposure—facing the thing you're afraid of. If you're afraid of dogs, you have to be around dogs to overcome that fear. If someone is afraid of movement, you have to move. You have to actually engage in activities. Somebody can tell you it's safe, but until you do it and nothing horrible happens, it will be hard to overcome your fear. Pick a goal and start out with a little bit of something. If your goal is to spend three hours out cruising around, you start out with two minutes or five minutes and gradually try to build up your endurance. Do it at a pace that allows you to last the length of time you want to do it, and make sure you use the correct technique. Talk to your health care provider about what activities and movements are safe so you don’t become inactive out of fear. Often when people are uncomfortable or in pain they want to be left alone. If you have pain all the time, there's a tendency that you will withdraw from others. That can drive people away from you, and you'll lose an important part of your life by doing that. You can also drive people away if pain makes you grouchy, grumpy and irritable. Don’t make others guess what you want. When people are around someone who is in pain, they don't know whether they should ask, "How is your pain today?" because your response might be, "Well, until you brought it up, it was fine. But now that you brought my attention to it, it hurts." But if they don't ask, you might think, "They don't care. They don't even ask." It’s easier on others if you tell them that you like to be asked how you're feeling or if you need help with something. If you don't want be asked, it's okay to tell them that. People are generally happy to respond to you the way you want. They can't read your mind. When people see someone in pain or someone struggling physically, they want to do something to help, and if there isn't anything they can do to help, they feel guilty. Telling them there's nothing they need to do lets them off the hook. Likewise, telling them how they can help will give them some direction.